Big fast planes are okay, but I prefer small, slow, quiet planes. Planes that can fly anywhere, and don't require travelling to a big field. After all, that's why I quit flying alcohol fuel planes and got into electric this time around. I have a couple of small-field planes -- the Edge and the Triangle -- but they're both quite fragile, and difficult to transport since neither one disassembles. I wanted something I could toss into the car (or a suitcase) and take with me without having to worry about it. I had been eyeing the Mini IFO for quite a while. IFO stands for Indoor Flying Object, but you can't take the word "indoor" too seriously in this hobby; lots of things say "indoor" and what they really mean is "indoor, if you're allowed to fly in the Moffet Blimp Hangar." 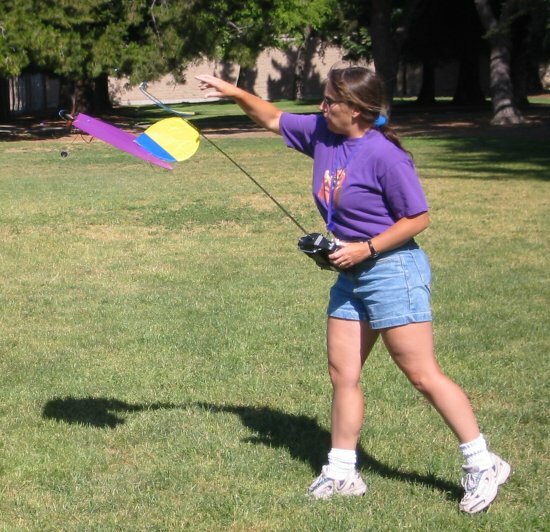 Lots of people around here have Mini IFOs, and carry them around when they go flying. Nobody ever flies them. The couple of people I've asked say they like it, but also say that it flies fast, that the Lazy Moth is much slower and more appropriate for indoor and small space flying. The Lazy Moth also intrigues me (I've seen them fly a number of times, and they're very cool), but it's a lot bigger, and being a rudder plane with no ailerons, it's not very aerobatic, while the Mini IFO claims to be. So I finally broke down and bought one. The Mini IFO is a bit tricky to build, but doesn't take very long. The box said "build in an evening", Perry at Aeromicro predicted two, and Perry was right (as usual). Construction mostly involves holding carbon fiber rods together while wrapping kevlar thread around them, then soaking the thread with CA glue and spraying with accelerator. This works well and is fairly easy, except for the handful of steps where you have to hold tension on the carbon fiber rod somehow with one hand while doing all of the above with the other hand. For those steps, it usually took me three or four tries before I got all the thread wrapped enough to soak 'n' spray without releasing my one-handed tension on the assembly too early. I was disappointed that the photo on the kit shows a contrasting tail color, but doesn't actually provide more than one color of ripstop nylon covering. If you've ever tried to fly a plane that's all one color, you probably know that it's very difficult to keep track of which direction it's going. In fact, I crashed the Mini-IFO the first couple of times I flew it because it went inverted and I didn't know it and couldn't tell from looking. I ended up using yellow Zagi tape as a temporary measure, because I couldn't find any ripstop nylon at the local fabric shops. Aero Micro carries it (from the same company that makes the IFOs), but $10 for enough to cover a whole IFO when all I need is 6" square for the tail? Aside from that, the instructions were pretty good and it wasn't nearly as hard to build as I first feared when taking it out of the box. I powered it with a GWS IPS-A motor (the gearbox gets glued in as part of the build, so changing it isn't a casual thing) and I've used either a 9x7 or 10x47 prop. The 10x47 gives it a bit more thrust at low speeds, which is good, but it also has more torque effect, which makes it a little harder to catch. I couldn't wait. I have no patience, and besides, time was short as I was leaving on a trip in a few days. So my Mini IFO had its maiden flight on my street corner, at night under the streetlights. I know that's stupid with a new plane, but hey, flying in small spaces was why I bought this beast, no? I set it down on the street, pointed into the wind, gave it a tentative bit of throttle ... and it launched promptly into the air. 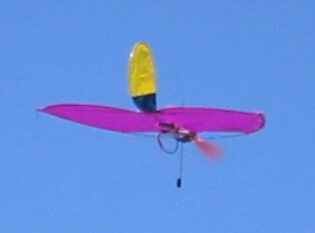 It's quite impressive how little throttle this kite needs to take off -- less than any of my other IPS planes, even though it's not all that much lighter and it just has a flat wing with no airfoil. Once I got past flipping inverted, I experienced another weirdness: I'd fly around for a while just fine, then go into a shallow dive (perhaps preparing for a loop) and the IFO would just nose down, refuse to come out of the dive, and crash. This happened twice. My theory is that my control wires were too small. I didn't use the pull/pull system recommended in the plans (though in retrospect, I probably should have), but rather a normal system of control wires from the servos to the underside of the elevons. This can work, but use thick, beefy wire: it has a long way to travel and no support along the way. Once I switched to thicker wires, this problem went away, and the IFO started flying much better. And it does fly! I don't know why everyone says it's too fast; it's probably the slowest flier I have. 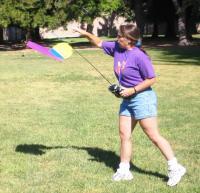 It can fly nicely at 1/4 thottle of an IPS, and can hover or land gently straight down in only a slight breeze. As mentioned previously, it flies great inverted; it loops and rolls okay, but it needs an amazing amount of elevon throw (even more than the recommended 2") and I'm having trouble getting that much even using micro control horns and my longest GWS servo arms, and overcranking the servos at the transmitter. With a little over 2" throw (that's each direction, believe it or not) it does quite competent if not spectacular loops, both inside and outside, and slowish rolls (not the 2-per-second mentioned on the box). The battery and servo mount frailty were discussed before, under Building. Otherwise, it might actually be reasonably rugged ... time will tell. I like the way the front carbon rod protects the motor at least to some extent; you can still bend or break props, but any serious motor damage is unlikely. The pivot for the landing gear (a fairly cute and ingenious setup, incidentally) also seems to be working loose; I needed to brace it with an extra kevlar line running from the top of the stick running backward (because it can't run from underneath forward -- the motor is in the way). I finally saw someone else with a Mini IFO, at a local indoor flying group. Lots of people here own them -- I see them on tables, or people carrying the boxed kits, all the time. 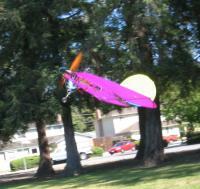 But you hardly ever see anyone fly one, which is one reason I hesitated so long before buying it. This fellow obviously knew what he was doing, accomplishing aerobatics in the tiny half-gym where I was wobbling around trying not to hit the wall, so I took a close look at his plane, and learned something interesting: he had built it upside down. All the gear was on the same side as the tail. Also, his IFO didn't have the landing gear. The more I thought about it, the more sense it made. If the battery and servos aren't hanging down, then they're less likely to rip off in a hard landing. The wheel never worked well for me anyway, because it wouldn't stay pointed straight (perhaps my fault for not sandpapering the wire first), and it adds weight. So I rebuilt my IFO: I removed the landing gear, removed the tail attachments, then re-glued the tail attachments at angles which would work for the tail on the other side. (I used CA debonder, wire cutters, and an x-acto knife to remove the existing pieces.) I also moved the tail forward slightly, since my IFO tends to be fairly tail heavy, and for the vertical piece I used a much longer piece of carbon fiber rod, compared with the short plastic rod the original design used, to keep the tail in place better -- it's rather floppy as originally designed. I'm quite happy with the result. It flies much better with the de-flopped tail (which still flops, but far less than it used to) -- I definitely recommend using a longer vertical tail support than the design calls for. The electronics are better protected on the top side and less likely to detach on landing, and the lighter weight (about 4.6 oz including a 500mAh 2-cell lipo battery) means it can fly even more slowly than before (good for indoor and small-field use). Rolls are much more controllable (I'm sure that's the improved tail) and it's fun to practice flying between trees in parks. I only hit the trees now and then. Of course, landings are an issue now, since it now has no protection from scraping the ground; but the wheel didn't protect it much, and it's pretty rugged anyway. And now that it flies so slowly and controllably, it's surprisingly easy to catch: even a klutz like myself can catch it most of the time.